The pregunta (pronounced pre-goon-tuh) is a Spanish poetic form that is a type of argument between two poets. It consists of alternating lines between the two voices, the first of which poses a question, and the second of which responds to it. Generally, the questions take on unrhymed lines, while the answers follow a rhyme scheme. The form looks like this. x a x a x b x b x c x c etc. In some cases the same question is repeated over and over. In a variation on the form, Laura Purdie Salas wrote a pregunta for your Picasso ekphrastic challenge. This variation includes a question followed by a rhyming couplet. Check out her poem, I Don't Know Art, But I Know What I Don't Like, and see a video of her writing and revising process. If you want to read another perspective on this form, try Poetry Magnum Opus. So, there's your challenge for the week. I hope you'll join me in writing a pregunta. Please share a link to your poem or the poem itself in the comments. Since it's February and we've had a few snow days already, I wanted a poem on the winter doldrums or snow. However, I came across this poem and decided it was exactly what I needed to share today. I do hope you'll take some time today to check out all the wonderful poetic things being shared and collected by Donna Smith at Mainley Write. Happy poetry Friday friends! 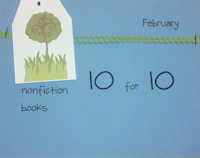 How could I possibly pick the 10 nonfiction books I can't live without? Frankly, it's an impossible task for me. I use children's literature in every class I teach. I loan them to students, take them on school visits, and read them to my kid (who is now 15). I also create a LOT of thematic book lists for teachers, so as I look at my shelves I find them lined with favorites. Since I couldn't settle on a topic or find it in my heart to stop at 10, I asked my son to pick some of his favorite books to share. Here are the books he remembers fondly and thinks other nonfiction loving boys will enjoy. I'll add that I believe boys and girls, avid and reluctant readers—ALL kids will find these interesting reads. So without further ado, William's list. Whatever you do, don't let the first title scare you away, as this is a pretty amazing list of titles. 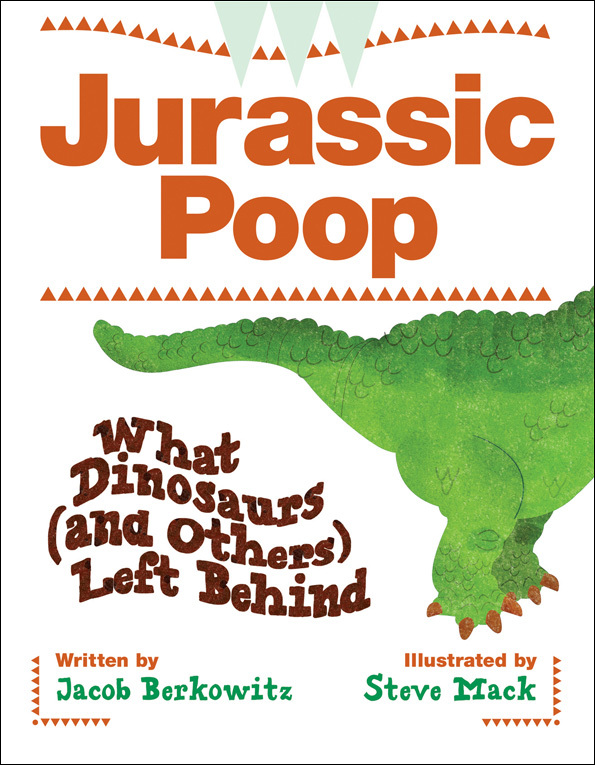 Jurassic Poop: What Dinosaurs (And Others) Left Behind, written by Jacob Berkowitz and illustrated by Steve Mack is a book about ancient poop. 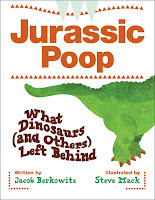 This is a boy's dream--dinosaurs and poop in one book! I'm not a fan of potty books or humor, but must admit that this book is a real gem. Chapter 1, A Message From A Bottom, begins with illustrations of a T-Rex leaving a turd "larger than two loaves of bread" and shows how that "king-sized poop" becomes a coprolite. Coprolite is the "polite word for fossil feces." Readers learn that coprolites can be frozen, dried or lithified. They also learn about doo-doo detectives (scientists who study coprolites) and much more. There is humor in this book, a huge number of synonyms for poop, and a TON of science. 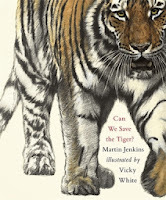 Can We Save the Tiger?, written by Martin Jenkins and illustrated by Vicky White, is an oversize volume with gorgeously detailed pencil sketches and a text that neither talks down to readers nor glosses over the difficult problems we humans have created. While Jenkins begins by discussing animals that are now extinct and why that is so, he goes on to discuss endangered species and once-threatened animals whose numbers are now on the rise. Discussing endangered species is a complex issue, impacting not only the animals themselves, but the humans that live in close proximity to them. Saving animals, while noble, is not always a black and white issue. Jenkins tackles this head on in a conversational and understandable way. Animals profiled include dodo, stellar sea cow, marsupial wolf, great auk, broad-faced potoroo, tiger, Asian elephant, sloth bear, African hunting dog, partula snail, quokka, mariana fruit dove, ground iguana, white-rumped vulture, sawfish, European crayfish, golden arrow poison frog, American bison, white rhinocerous, Antarctic fur seal, vicuna, kakapo, Rodrigues flying fox, whooping crane, Bermuda petrel, and polar bear. On the final page readers will find an illustration of Sander's slipper orchid, a plant that is protected because it is endangered. Back matter includes suggestions for further Web research and an index. 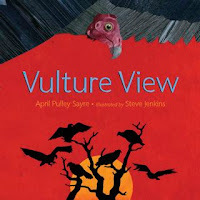 Vulture View, written by April Pulley Sayre and illustrated by Steve Jenkins - Scavengers and decomposers play a very important role in maintaining the balance of the ecosystem. In helping to break down dead organisms, they are responsible for returning basic nutrients to the soil so that they may reenter the chain. In this book, we get a glimpse of the scavenging role that vultures play. I know that right now some of you are saying, "Gross! Why would I want to learn about these disgusting birds?" Here's my response. First, vultures are incredibly clean birds, bathing and preening regularly. Second, and more importantly, vultures are a vital part of our natural environment, cleaning up dead carcasses and decreasing the spread of some diseases. Third, they're just plain interesting. In rhythmic, precise text, Sayre teaches us much about the amazing turkey vulture. Here's an excerpt on how they find their food. Readers learn that vultures soar on thermals, taking to the air as it warms, returning to roost in the trees as air cools. The book ends with a section entitled Get To Know Vultures, with the Subsections: (1) Soaring Up, Up, Up! ; (2) The Vulture Family; (3) Nature's Cleanup Crew; (4) Family Life and Range; and (5) Heads Up, Young Scientists. It is packed with information and even includes a link to the Turkey Vulture Society's web site, as well as information on festivals that celebrate vultures/buzzards. 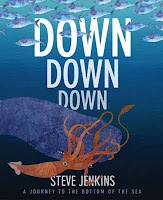 Down, Down, Down: A Journey to the Bottom of the Sea, written and illustrated by Steve Jenkins, treats readers to the wonder of the world's oceans. Jenkins' tour of the oceans begins at the surface and ends in the Marianas Trench. Each double page spread contains a paragraph (or two) of information about that particular depth, illustration of the inhabitants, and a depth meter. The depth meter appears on the right edge of each spread and extends from the top of the page (the surface) to the bottom (deepest spot in the ocean). The depth is marked with what looks like a red push-pin and is labeled with the distance below sea level (in both feet and meters) and the temperature (in both Fahrenheit and Celsius). How much do we really know about the earth's oceans and the creatures that live there? The answer is, not much. In clear, concise text, Jenkins takes us on an unbelievable, fact-filled journey. The illustrations of the creatures, from the beautiful and familiar to strange and exotic (weird! ), are gloriously rendered. (See images here, here and at this terrific review at Seven Imp.) At the end of the book are five full pages of background information on the animals in the book. Each section includes a diagram that shows the size of each creature compare to an adult human's body or hand. The final page includes a brief bibliography and another depth meter that shows how deep humans and sea vessels can descend. 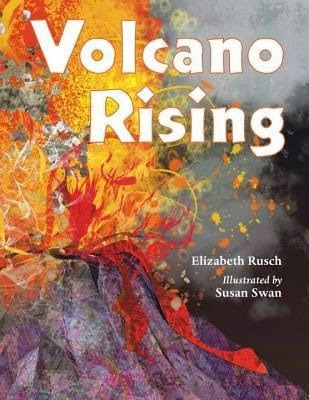 Volcano Rising, written by Elizabeth Rusch and illustrated by Susan Swan, looks at volcanoes as constructive forces of nature, building up the surface of the Earth. Beautifully illustrated in mixed media with lots of examples and labels, this book uses two levels of text to engage readers. The first level of text provides readers with basic volcano information. This is accompanied by detailed informational text that provides more comprehensive information on volcanoes. Both levels of text are well-written and make the concepts accessible for readers across a range of ages. 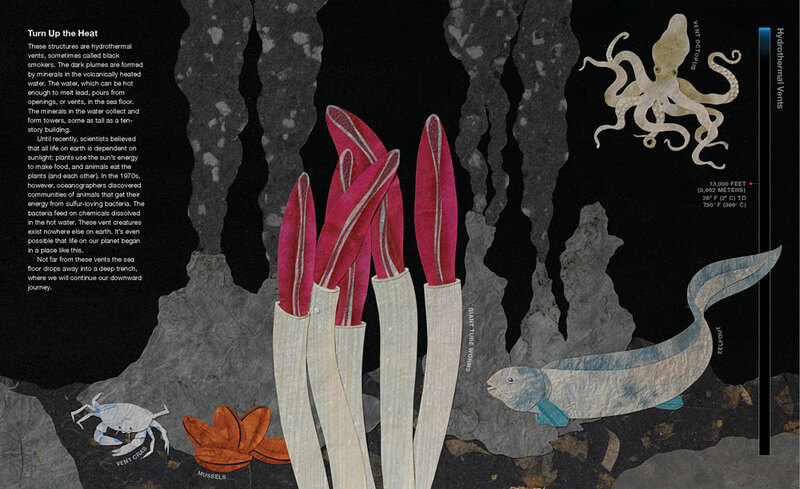 Together the text and illustrations offer a dramatic introduction to volcanic activity. Rusch introduces readers to 8 different volcanoes around the world and explores their impact when found in what some might consider unusual places, like under a glacier or on the seafloor. Back matter includes a glossary of 30 volcano vocabulary words and an extensive bibliography. 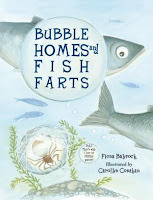 Bubble Homes and Fish Farts, written by Fiona Bayrock and illustrated by Carolyn Conahan, is an all-out fun-fest of animal bubbleology. Ho do animals use bubbles? After reading this title, a better question is how don't they?! Before reading this try to guess what animals and/or bubble strategies might be highlighted. Whales and bubble netting? Check. Tree frog nests? Check. And ... that's where the knowledge of most readers ends. Who knew there were so many ways to use bubbles? All total, Bayrock has introduced readers 16 different animals that sail through the water, run on its surface, and even taste disgusting, all thanks to bubbles. 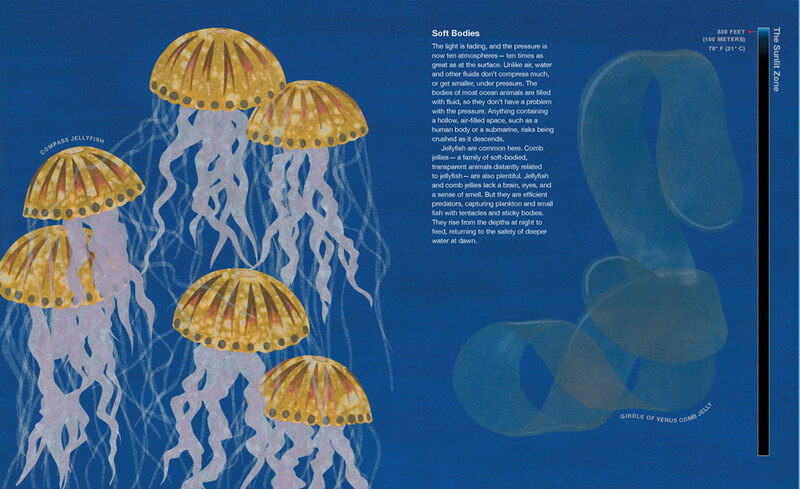 The back matter in the book contains end notes about each animal, including its habitat, where in the world it lives, and even more amazing facts. There is also a glossary of terms and an index, as well as a lengthy list of acknowledgments, a huge number of them scientists and scholars who aided the author in her research. This is a well-researched, thoroughly engaging book for studying animals and the way they adapt to their environment. What's for Dinner? 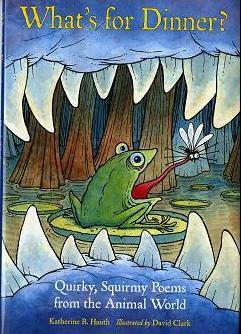 : Quirky, Squirmy Poems from the Animal World, written by Katherine B. Hauth and illustrated by David Clark, is a collection of poems about food chain topics. The introductory poem, "What's for Dinner," explains why animals must find food. What follows this introductory piece are humorous, graphic, scientific, inventive and just downright fun poems. Accompanied by equally graphic and humorous illustrations, the perfect pairing of word and art gives us a book that readers will love. In the poem entitled "Waste Management," a rather haughty-looking vulture pulls at a strand of the innards of a carcass while standing on the exposed ribs. While most of the poems are about animals, the last entry, "Eating Words," uses poetry and word roots to define insectivore, carnivore, herbivore, and omnivore. The back matter includes a section entitled More Words About the Poems, which explains a bit more of the science and further explains vocabulary terms such as symbiosis, parasitism, mutualism, commensalism, and more. More Words About the Animals provides background information for each of the poems. The final page of the book provides some additional titles for learning more about the animals in the book. Hottest, Coldest, Highest, Deepest, written and illustrated by Steve Jenkins, is a book that examines extremes in the natural world, such as the highest mountain (based on elevation), longest river, location with the most extreme tides, the driest spot on earth, and more. Jenkins grabs the attention of readers from the first page and makes them want to know about all these places. On every double-page spread that follows is a statement of fact, an inset map showing location, a bit of informational text, and some other graphic to help readers visualize and better understand the information. There is no back matter in this volume, but the final page does include a world map that pinpoints the 12 locations described. 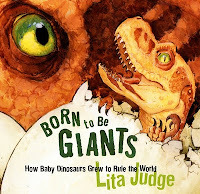 Born to Be Giants: How Baby Dinosaurs Grew to Rule the World, written and illustrated by Lita Judge, not only answers this question, but explores how dinosaurs hatched from eggs grew and survived to become some of the largest creatures that ever walked the earth. Judge uses evidence discovered by paleontologists and to hypothesize how dinosaurs may have behaved. Judge doesn't shy away from difficult vocabulary in the text, using words like altricial and precocial. However, readers are supported in understanding these words through simple, explanatory sentences, as well as the inclusion of a glossary. Eight species of dinosaur are explored in the book. 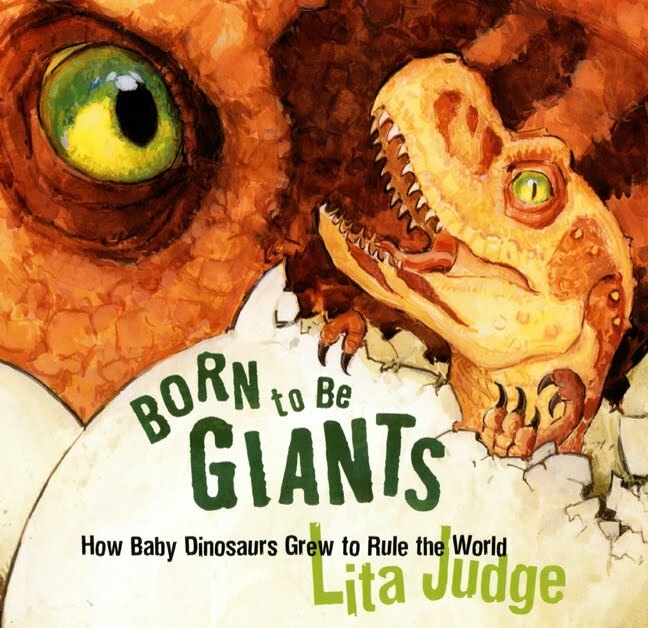 Early on readers are introduced to Argentinosaurus, a dinosaur that likely weighed as much as 17 elephants. Imagine for a moment just how large this dinosaur must have been. Now juxtapose this with the knowledge that the largest dinosaur eggs ever found were only 18 inches long. As Judge tells readers, "These mothers probably couldn't protect their tiny babies without trampling them underfoot." Dinosaurs may have been giants, but surviving to adulthood was no easy task. The text leaves readers much to ponder while also providing a wealth of factual information. There are some brief notes in the back matter about each of the dinosaur species, including pronunciation (always important with dinosaur names), approximate size, location of fossils, and period of appearance. Nic Bishop Frogs, written and photographed by Nic Bishop, provides readers with a thorough introduction to members of the order Anura. Found on every continent, frogs and toads (which are just a type of frog) come in every imaginable size and color. Bishop does an outstanding job presenting this variety in the photographs and text. The text in this book is inherently understandable. Each page has a main idea written in large font, a paragraph of information, and a short section in small font with an additional fact or two. Every page is filled with scientific information, amazing and sometimes quirky facts, and gorgeous photos. One the page accompanying a photo of a glass frog (one in which you can see through its skin to its internal organs), readers learn that frogs have 159 bones, nearly 50 less than the number found in the human body. Bishop explains that frogs do not have rib bones, and that this explains why frogs are so good at squeezing through "small gaps, like between your fingers when you are trying to hold them." It is clear that Bishop has his readers carefully in mind. Scientifically, he doesn't talk down to them, but rather helps to make the mystery that is life and science more understandable. The conversational tone hooks readers and keeps them interested. What kid hasn't wanted to hold a frog in his/her hand, only to have it wriggle away? The text as a whole is thoughtfully laid out and proceeds in an orderly and reasonable fashion through a variety of topics, from where frogs live, to what they look like, how their bodies are constructed and adapted, their eating habits, means of escaping predators (camouflage and those incredible legs and jumping skills), the sounds they make, reproduction, and much more. In the back matter, Bishop devotes two pages to describing his love for his work, the process of photographing frogs, and the interesting experiences he had along the way. Kids will love learning about how he captured the images on film almost as much they will love learning about the frogs. So, there you have it. These works of nonfiction are sure to spark curiosity and delight many young readers. And by the way, the teenage boy had difficulty stopping at 10 too! Settling on one Nic Bishop book was struggle, as was deciding which Jenkins' books to leave off the list, or which dinosaur book to choose. All in all, he did a fine job. I hope you love these as much as he does. I know I do. The quintilla is a Spanish form consisting of a five-line stanza. Normally the lines contain 8 syllables and have only two rhyming sounds. There are many rhyming patterns used, the only one that is avoided is one that has a final rhyming couplet. Here are several rhyme scheme options. You can read more about the form at this Writing.com entry. So, there's your challenge for the week. I hope you'll join me in writing a quintilla (or two). Please share a link to your poem or the poem itself in the comments. In honor of Charles Darwin's birthday today, I'm sharing an excerpt from a book written by his grandfather. And second planets issued from the first. Organic Life began beneath the waves. Melts into lymph, or kindles into gas. Some may call this work didactic, but I think it's a fine early effort at using poetry to make science accessible to the average citizen. I do hope you'll take some time today to check out all the wonderful poetic things being shared and collected by Kimberley Moran at Written Reflections. Happy poetry Friday friends! a a / b b / c c / a b c.
So, there's your challenge for the week. I hope you'll join me in writing a trine (or two). Please share a link to your poem or the poem itself in the comments. Poetry Friday - Welcome Mat Is Out! Welcome poetry lovers! I'm happy to be hosting Poetry Friday this week. I'm especially thrilled to be hosting on a day when the Poetry 7 gang is sharing a crop of new poems. You can read the ekphrastic poems written by my Poetry Seven compatriots at the links below. Andi Sibley - Andi's a bit under the weather, so please send virtual hugs and healing thoughts her way. We'll hold down the fort until she's well again. We miss you, Andi! I hope you'll help me celebrate poetry this week by joining in the round-up and visiting other folks sharing their thoughts. I'm and old-school style host, so please leave a note with a link to your offering in the comments. Thanks to all of you who stop by to read, write poetry, and share in the love of children's literature. Robyn Hood Black of Life on the Deckle Edge is sharing a lovely little poem entitled Groundhog Day and a story about her neighbor that will make you smile. cbhanek of Quick Thinks About Literature & Life isn't giving up on snow-inspired photo poems and shares a new poem entitled Chillin'. Diane Mayr of Random Noodling shares a poem entitled 2016 Antique Mart. Jone MacCullough of Check It Out shares her poem Super Bowl Sunday. Joy Acey of Poetry for Kids shares the poem Ducks and issues a poem writing challenge. Sally Murphy checks in from Down Under and shares a lovely little photo poem. Heidi Mordhorst of my juicy little universe muses a bit on the nature of blogging and shares a poem entitled INSTRUCTIONS | dmmg. Amy Ludwig VanDerwater shares a poem entitled The Traffic Lights. She also shares an image of her draft and some wise advice for writing. Ramona of Pleasures from the Page shares a short poem about her upcoming day. Fingers crossed that she has time to share a poem with her students today! Brenda Harsham of Friendly Fairy Tales shares a poem entitled Squirrel Haven. Bridget Magee of wee words for wee ones made me laugh out loud! Check out her poem entitled The Ex Files. Violet Nesdoly is still thinking about and writing nothing poems and shares one entitled I Read Nothing. Liz Steinglass is sharing a lovely poem entitled Fog. Kay of A Journey Through the Pages is sharing a haiku in defiance of snow. Penny Parker Klostermann shares a new post in her series A Great Nephew and A Great Aunt and highlights a beautiful art and poetry collaboration between Irene Latham and her 9 year-old niece. JoAnn Early Macken of Teaching Authors shares a poem entitled Staring Out the Window. Laura Shovan of Author Amok invites everyone to join in a month-long daily write-in. All of the information people need to participate (and the Week One prompts) are at 2016 Found Object Poem Project. Matt Forrest Esenwine is hosting Laura Shovan's Poetry Prompt series today and sharing his poem entitled Heirloom Moon, along with those written by others playing along. Mary Lee of A Year of Reading is also participating in the found object poem fun and shares a poem entitled Mysteries. Linda Baie of Teacher Dance shares her response to today's found object in a poem entitled Early Valentine's Day. Carol Varsalona of Beyond LiteracyLink shares a couple of found object poems and issues a reminder about the invitation to the upcoming gallery, Winter Wanderings. Molly Hogan of Nix the comfort zone shares her found object poem entitled One Plump Tomato. Keri of Keri Recommends shares the poem The Other Side of a Mirror by Mary Coleridge. Diane Mayr of Kurious Kitty's Kurio Kabinet shares the poem Merry-Go-Round by Langston Hughes for Black History Month. Tara of A Teaching Life shares the poem Thinking of Flowers by Jane Kenyon. Tabatha Yeatts of The Opposite of Indifference shares poems by Joy Acey and Robyn Hood Black and sets them to music! Jama Rattigan of Jama's Alphabet Soup shares a gorgeous Friday Feast that includes Adele Kenny's poem entitled To Blueberries AND a recipe for Bluemisu. Carol of Carol's Corner provides her own poetic and heartbreaking introduction to the Langston Hughes' poem Let America Be America Again. Catherine of Reading to the Core is sharing two poems by Judith Moffat and Marilyn Singer that connect to her one little word for the year. Ruth of There is no such thing as a God-foresaken town shares the poem Questions of Travel by Elizabeth Bishop. Donna Smith of Mainely Write took up Tabatha's poem/song matching challenge and has selected music to go with poems by Tabatha Yeatts and Irene Latham. Little Willow of Bildunsroman is sharing the poem The Awakening of Dermuid by Austin Clarke. Janet of All About Books with Janet Squires shares the poem Birches by Robert Frost. Doraine Bennett of Dori Reads shares the poem Reply to the Question: "How can You Become a Poet?" by Eve Merriam. She also rounds up a whole bunch of her poems in this post. Carlie of Twinkling Along shares the poem Genetics by Jacqueline Woodson. Myra of Gathering Books introduces readers to the book all the words are yours: haiku on love and shares a few excerpts. Michelle Heidenrich Barnes of Today's Little Ditty welcomes David L. Harrison as February's spotlight author, shares his newest poetry collection, and offers up this month's ditty challenge. Margaret Simon of Reflections on the Teche shares Irene Latham's new book When the Sun Shines On Antarctica, along with some of the poems and poems written by her students in response. Irene Latham of Live Your Poem shares a Cybils nominated poetry book, Sleepy Snoozy Cozy Coozy: A Book of Animal Beds. Tamera Will Wissinger is celebrating the release of her new book There Was An Old Lady Who Gobbled a Skink. Congratulations Tamera! Mandy of Enjoy and Embrace Reading shares the book Messing Around on the Monkey Bars by Betsy Franco and an excerpt. Sylvia Vardell of Poetry for Children shares a mega-list of resources for celebrating Black History Month with poetry. My post for tomorrow will go live at 12:00 am and not one second sooner. (I mean, that IS when Friday begins, right?) For all you Left coasters or East coast early birds, go ahead and leave me a note here and I'll round you up early.